Here we have a DreamWorks animation which is a wonderful advertisement for the high state that CGI has achieved. The rendering and colours, shading, shadows, highlights and movement are all excellent. The story is a very familiar one which you will have read and seen a thousand times before. All the best stories are like that. What makes this one rather good is the original setting and visualisation that DreamWorks bring to the screen, On IMDb it scores 8.2/10 and on RottenTomatoes it score 7.9/10 - they are two impressive scores. "This is Berk. It's twelve days north of Hopeless and a few degrees south of Freezing to Death. It's located solidly on the Meridian of Misery. My village. In a word? Sturdy. It's been here for seven generations, but every single building is new. We have fishing, hunting, and a charming view of the sunsets. The only problems are the pests. You see, most places have mice or mosquitoes... We have..."
All the vikings have weird names - except the beautiful Astrid (America Ferrera) who provides the love interest for Hiccup. However, most have Scots accents and some have a American accents - truly weird as Vikings were neither, although they did reach and colonise both countries - but the accents do reflect the cast. Apparently the author of the story on which it is loosely based, Cressida Cowell, set the story in the Inner Hebrides, so perhaps it is artistic licence. The story is the archetypal misfit who cannot live up to his father's expectations finding a different way to win popularity, a different way to enable his people to live with the dragons and a different way to get his girl. It's a story about integrity in the midst of those coming-of-age years. 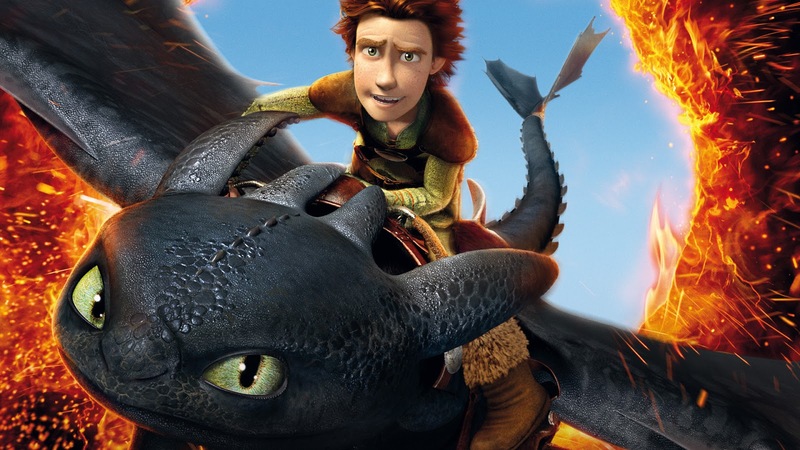 You know Hiccup is going to triumph, bring peace and prosperity to the village and get Astrid, but the 94 minute journey to deliver is thoughtful, well-paced and a visual treat. This a wonderful Father's day present from my youngest and I enjoyed watching it with her. I'll give 7.5/10 as I found the accents annoying! Well worth the watch. Enjoy. love this film! used in a sermon only last Sunday!